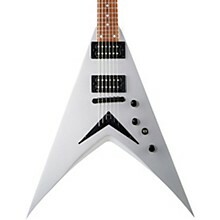 A Dave Mustaine V guitar at this price? You bet! With a basswood body and a maple top, a maple neck with a rosewood fretboard, and 2 powerful Dean humbuckers, this is an electric guitar that looks and sounds worthy of the flame-haired metal master's name and of a place in your hands! A string-thru bridge increases sustain, and a C-shaped Mustaine profile neck and 24 fast frets will have you shredding the night away. 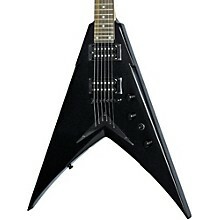 The awesome finish and black hardware look killer.